Confirmation that the new fleet are on the road. K1 -XL07 33809, K3-XL09 33811, K4-XL10 33803 and K19-XL06 33804 reported so far. The first of the new fleet, 33803 ready for action tomorrow. King's Lynn garage staff had an extremely busy day today preparing the new buses for tomorrow's mini launch. The new buses didn't come wired up for the Wayfarer ticket machines and this was being done today while other final touches were being carried out. Despite being excessively busy, Richard Tucker found time to confirm with me that he plans to have 9 on the road tomorrow. 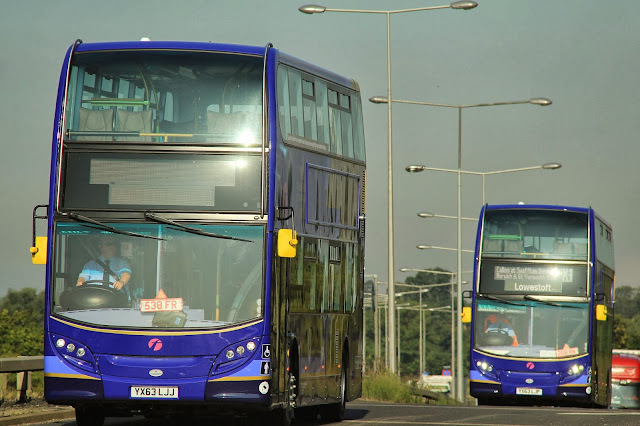 At 16.00 today, all the new buses so far delivered were at Vancouver Avenue except 33808/10/12/13 which were visible at the temporary compound along with Gemini 37578. As can be seen by enlarging the above 33812 is registered YX63LJZ and 33813 is YX63LKA. King's Lynn despatched 37156/9/60 to Norwich as expected today and 37158 was fetched from Lowestoft and dropped off at Norwich and will not need replacing as Lowestoft's X1 commitment is reduced from four to three vehicles as from tomorrow. Rather fittingly, tonight's last service to Peterborough on the last day of full operation was worked by 37563. 37563 heading up to Walpole Flyover with Karen F at the wheel this lunchtime. She said to me later "I wondered why you didn't wave and then I spotted the camera !" Saturday 28th September 2013 ~ End of a Timetable and an Era ! 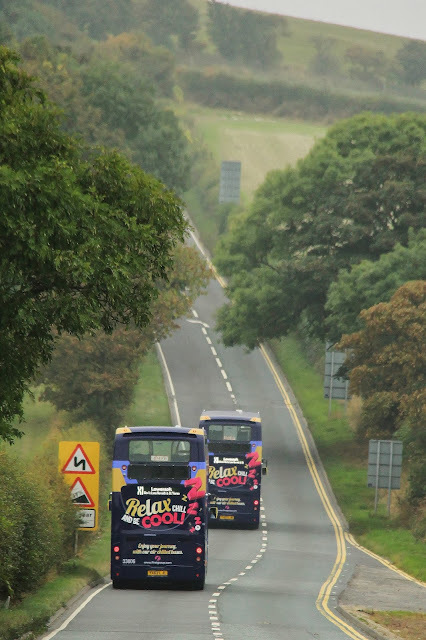 On 23rd October 2008, the first of a new fleet of Volvo/Wright Gemini double deckers hit the road and the saga of the'white elephants' had begun - this nickname proved to be quite inaccurate. but really suited them. On that first day (a Thursday), 37563/567/568 & 571 were the buses used, but it was some time before all 17 were in operation, the last ones being 37575/6 on November 12th 2008. In less than a year they had been joined by the five B7s to virtually eliminate coach operation on the X1. 33803 & 33804 are undergoing final inspections at Vancouver Avenue and 33810 -813 were also passed fit today. The remainder will follow tomorrow when the depot will be specially staffed and other contractors will be present to finish off final jobs, before Monday's partial launch of the Enviros. As I said earlier, nine should be in traffic with others following when they become available. 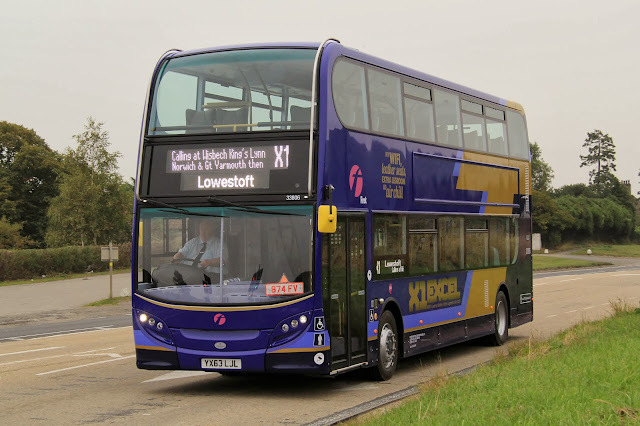 All the B7s bar 37158 ended up at King's Lynn tonight and it is likely that 158 will be swapped at Lowestoft to enable it to come back to Lynn on either XL06 or XL08 (K19 or K2) late tonight. We start with 37567 bowling through Walton Highway and with a friendly wave from Calvin. "I'd have done my hair especially if I'd known you were out with the camera" he said. I then pointed out that he hasn't got any hair ! 567 was working L9- XL15 due through here at 12.02 and running 15 minutes late at this point. Next port of call was one of my favourite locations near Walpole Highway and on what was a rather nice Autumn day, 37566 makes a pleasant sight working Y13-XL19 the 11.42 King's Lynn - Peterborough. With a healthy load it was running 19 late but made up time as we will see. 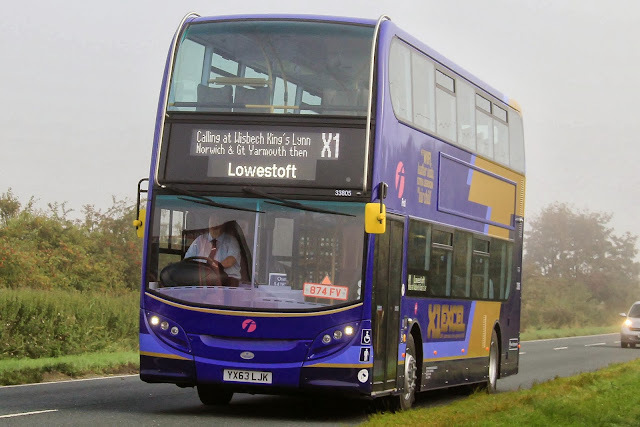 K16-XL03 is a pretty solid B7 turn which ends at Lowestoft, but with all five of the type required to overnight at Lynn for onward transit, today B9 37579 was called upon to work it. 579 is seen here near Terrington St. John. Secreted in a King's Lynn industrial estate we see a sextet of new Enviros holding a conference before their introduction to service on the X1 from Monday. The time is 13.53 and King's Lynn driver Wayne Savory is leaving 37578 for colleague Frank Martin to take forward to Peterborough. This is the South Gates bus stop adjacent to King's Lynn First HQ. Wayne recently won a First award for having the best Drive Green rating in the Eastern area. It's 37566 again, this time back at Lynn and Driver Elcombe has managed to regain almost all of the 19 minutes lost time we mentioned earlier. 566 is about to load to work the 14.30 to Lowestoft. Almost a carbon copy of the previous picture, this is 37571 with a long queue of passengers waiting to board XL06-K19 14.42 to Peterborough. 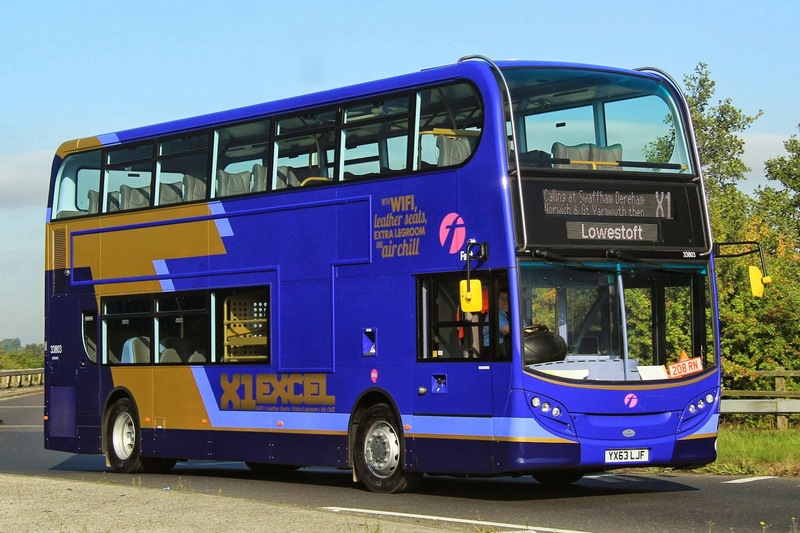 571 is the lowest mileage B9 Gemini in the X1 fleet after being rebuilt following the accident near Thorney it suffered in 2009 for which the driver was not at fault. K14 13.38 Peterborough - Lowestoft passes King's Lynn railway station with 37570. 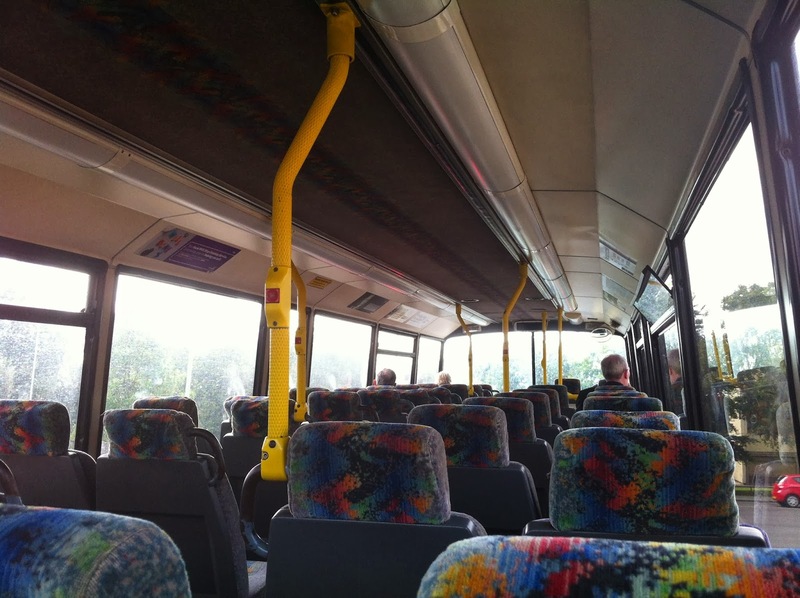 This was the only one of the B9s to receive an overall advert on the rear which was removed in March 2013. 37158 in its smart new colours prepares to work the 15.12 King's Lynn - Peterborough (K1-XL07), This was the final day of B7 Gemini working on the route. The sun is setting and Driver Gary Saban running to time brings 37563, the first numerically of the B9s, towards Walpole at Fence Bank on Y6-XL12 17.42 King's Lynn - Peterborough. 33423 with 37160 and 37156 in King's Lynn garage this evening, their X1 work completed. 37159 (left) was the last of the B7s to receive the corporate livery and only worked on the X1 in this condition on Friday and Saturday, to the right is 37157 which may be staying a little longer at Lynn while outstanding repairs are completed. The advert on 37159 was applied tonight, but the Enviros escaped having them as the necessary studs are not being fitted until tomorrow. Saturday is the final day of B7 Gemini working on the X1. 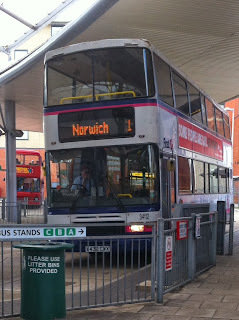 Tomorrow, Sunday, four B7s are due to transfer to NORWICH, temporarily due to heavy loadings on the UEA route. They are still due to travel north soon. 37157 is being retained at King's Lynn for some outstanding work to be carried out. On Monday there are due to be nine new Enviros in use on the X1 route. 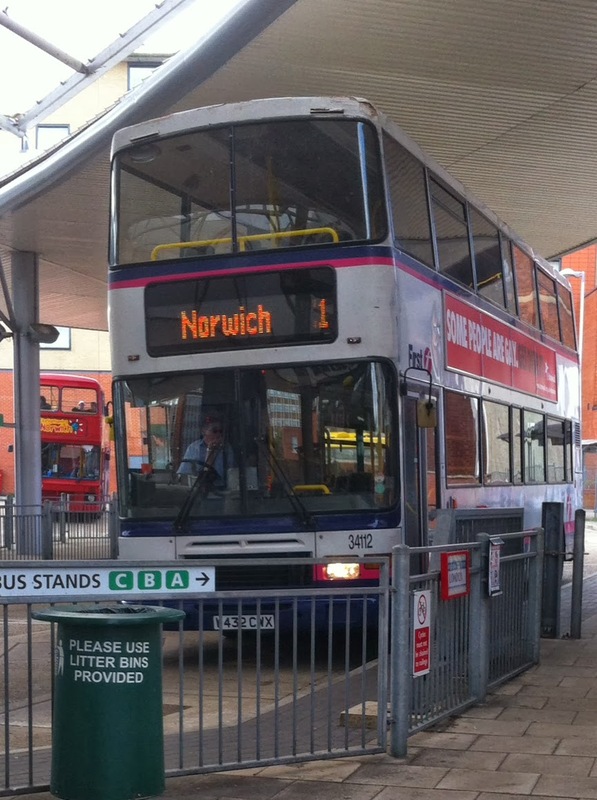 This should free up a number of B9 Geminis which will go to Yarmouth and Lowestoft. To begin with the B9s will be sent en bloc to Full Circle for repainting. Three B9 Geminis are to stay at Lynn until MOTs are carried out and another three have outstanding work to be completed before transfer. Further new Enviros are due to be delivered at a reduced rate in the coming week. A Saturday update later this evening. the cat is now officially out of the bag - the new Enviro 400s will feature on board announcements ! 33812 & 33813 joined the growing stud at King's Lynn today and 33803 - 33813 have now all been delivered leaving another 11 to come. The buses are likely to enter service as soon as they are ready now, as the B9s are urgently required further east. 37576 became the second B9 Gemini to depart for Full Circle today, its ultimate destination being Great Yarmouth. On the route things ran smoothly until the afternoon. 37574 on XL19-Y13 passed my window at Wisbech 26 late going eastbound, but it was a major accident between Eye Green and Thorney which closed the A47 until 22.00 tonight which caused major disruption. K18-XL05 which is due through Walpole at 16.35 finally passed Bruce at 18.08, 93 minutes late. K19-XL06 was not seen, but K1-XL07 with 37563 which had been on time going to Peterborough came back past Bruce at 18.14, 40 late. Later 33423 on K3-XL09 17.42 from Peterborough appeared at 19.44, 64 minutes late, closely followed by 37565 on K4-XL10. 37567 which came into Lynn on the 18.07 terminating service from Lowestoft was turned round quickly to work K2-XL08 18.33 back to Lowestoft, due to the late arrival from the west of 37573. When 573 did come in it worked K4-XL10 19.33 eastbound instead of the delayed 37565. Earlier in the day 37157 had been 16 late arriving in Lowestoft before working the 10.55 to Peterborough. 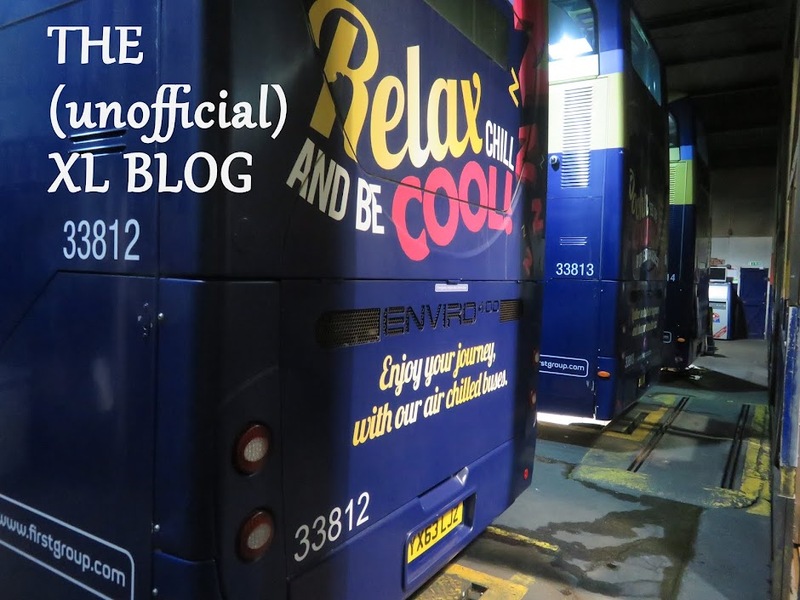 Another two new vehicles today, 33810 with the retail therapy rear ad and 33811 with the cool chill version. Registrations are YX63LJV and YX63LJY. Today also saw the return to King's Lynn of B7 37159, the final example to be repainted in First new standard livery pending departure for the Potteries. 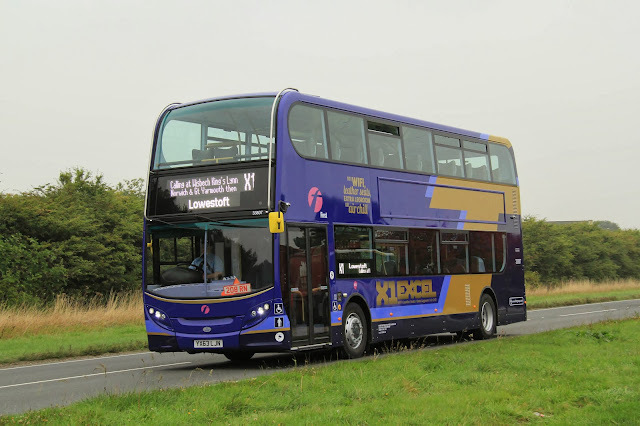 37567 returned to traffic today on K4-XL10. Timekeeping as in general of late was very smart today. Syd Eade says "I am sure there will be lots of 'last' photos but can I claim the honour of the first one please!!! ", certainly can Syd and Wayne C AKA Manchester at the wheel is posing for the camera too ! Now to finish today I had a nice email from Jamie Skinner who says "Been getting the old Volvo Olympians for 3 weeks flat now on shorts to College in Norwich, loads better than the Geminis and new buses to me -sadly looks like they're going to be sent to the Midlands to do contract work, I personally think they should be out on the Belton number 7 run where the extra capacity would be welcome. Sad to see them go!" Jamie took pictures on his mobile of 34112 at Norwich plus a picture of the upstairs interior, which I have reproduced here. With 37568 now effectively out of the X1 fleet and 37159 still at Full Circle, it was imperative that the buses behaved to keep the X1 running today. Last night though, 37566 - the bus that was built on a Friday, or so I reckon - started making funny noises on L12-XL18. On arrival at Lowestoft it was decided that 37157 off K14-XL01 should replace it for the return trip westbound. 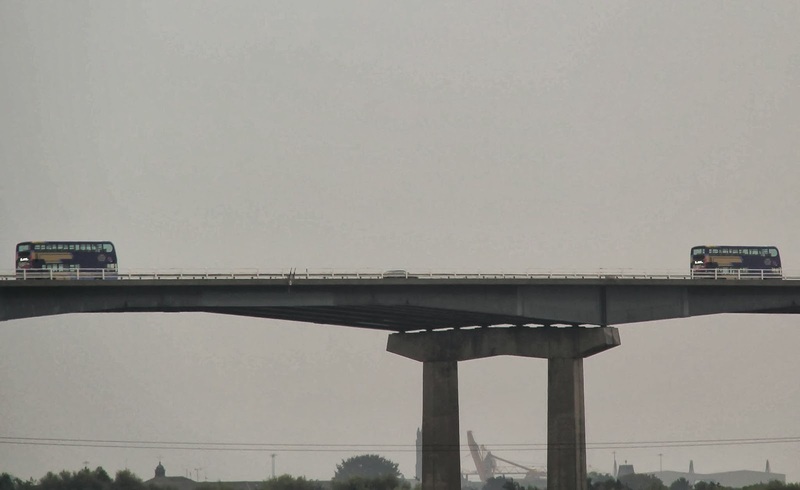 This meant that Lowestoft would be short of a vehicle this morning. To correct the situation, King's Lynn engineer Steve took 37569 over to Lowestoft at 5am in order that it could work L12-XL18 07.45 to Peterborough today. 37566 was then repaired and with 37156 due for a service and working K18-XL05, it was decided to put 37566 on K18 so that 37156 could return to Lynn for attention. Meanwhile 37567 was hastily repaired and put back together so that at least one vehicle was spare. YX63LJO - 33808 and YX63LJU - 33809 the latest arrivals at King's Lynn seen this evening. 33808 & 33809 have the X1 destinations in correct route order below the top deck windows. 33808 has the leather seats advert on the back and 33809 the retail therapy version. Yesterday's two arrivals, 33806/7 both had the air chill advert, so it looks as though there are at least three different styles of promotion. Having travelled 170 miles on trade plates, any teething troubles with the new buses are bound to manifest themselves. So far there have been minor problems with air conditioning, hydrostatic oil, and one has a nox fault, but all quite trivial in the grand scheme of things and nothing more than one would expect with a brand new fleet. 33810/11 are expected to arrive tomorrow. Finally today , something I've wanted to post for ages but have refrained from doing so, It's the fine old board in the garage at King's Lynn detailing the day's car allocation. Lovingly handwritten by Richard and his colleagues on a daily basis, it is a great survivor in this computerised age ! With all this excitement over new buses, it is easy to overlook the fact that the normal intensive service has to operate around it. Yesterday's new arrivals have been moved to the secure accommodation acquired nearby, while today's new buses 33806/7 remain at Vancouver Avenue. Gemini 37567 remains off the road while some tricky coolant pipework is replaced around a wheelarch - an absolute devil of an operation to perform. Big news today was the despatch to Full Circle of 37568 for repainting - 37159 is already there and may be back late tomorrow or Thursday. This means 37568 is unlikely to work through to Peterborough again, although tachographs will still be maintained until re-calibration is needed. The decision will then be made whether to keep the equipment serviceable - it would seem to make sense to keep them calibrated, as it is not a particularly expensive business and would mean they could still be used on the X1 in emergencies. Older readers may recall that coaches 20101/07/11 ran quite frequently on the X1 while carrying branding for the X2. Timekeeping on the route was exceptional today. Unusually, 37160 worked K15-XL02 until 15.35 this afternoon, when 37572 took over. K15 is normally a guaranteed B9 turn and in five years has only seen a B7 start on it a handful of times. By all accounts the new livery suits the B7s and they certainly look considerably smarter than before. The planned entry into service of eleven Enviro 400s on Monday, may be slightly cut as there are still final adjustments to be made before they hit the road. In particular, one top secret modification ( Don't even think about it ! I'm sworn to secrecy !!) - is being attended to and we will reveal all on the big day. In the meantime let's not forget the sterling work which some older vehicles have put in. not least on the X1 'shorts'. In this connection, here are a couple of pictures kindly sent in by Syd Eade of some old stagers taken in the sunshine yesterday. Thanks to Jamie & Kaylee Vendy for sending these great shots of the latest arrivals. Jamie kindly supplied me with up to the minute reports on the progress of the delivery runs thus far and I am very grateful for his permission to share the pictures on the X1 blog, they are of course, his copyright. I'm sure you'll agree these pictures are excellent and my thanks to Jamie and Kaylee for sending them to us. Monday September 23rd 2013 ~ .....and now they are here ! 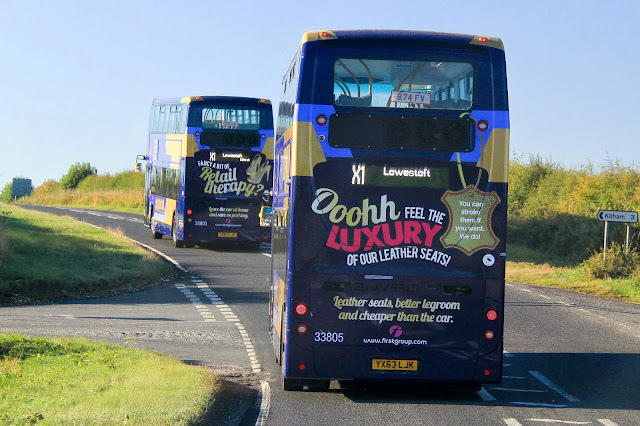 A pictorial look at this afternoon's arrival in King's Lynn of the first three Enviro 400 buses for the X1, numbers 33803/4/5. It is hoped that to start next Monday's new timetable eleven will be available for service. The first B9 should depart for repainting when 37159 arrives back. It is now thought that 37563 - 571 will be allocated to Lowestoft for the X2 and 37572 -79 will have Yarmouth branding in the new standard First livery. 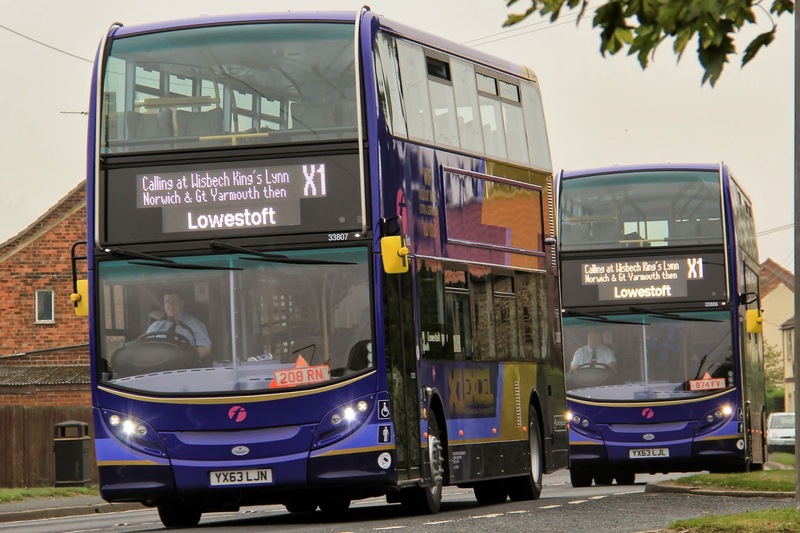 It's a few minutes after 15.00 and the trio of Enviro 400s arrive, the leading one with blank destination display and the rear two with variations on the Lowestoft theme. The buses came in via South Lynn which gave the locals some entertainment. Rear advertising on the rears of 33804 & 33805, shame about the reflections - shows how clean they are !! 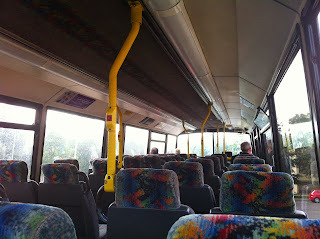 Interior shots of 33803, note the temporary paper floor protection on the upper deck. 33804 arrived with destination vinyls below the top deck windows , but the order of locations was wrong and this is being corrected locally. Excel boss Rosemary Parry and King's Lynn depot manager Richard Tucker with 33803. Hmmm, now where are we going to put all these new buses ? They are on the way !